Super featherweight Les Byfield is finding his quick feet once more as he targets an eighth consecutive professional boxing victory writes Tom Heslop. Byfield has revealed ahead of his upcoming fight against his former sparring partner Andy Harris that he has been putting in extra training to bring back his lightning-quick feet that he was so well known for when he in the amateur scene. The 30-year-old from Netherton, Dudley, will be fighting on Sunday, December 17th in the Stadium Suite at WFC The Venue as part of BCB Promotions’ ‘Jingle All The Way’ event. Byfield will go up against Harris in what will be his first six-round match and he is hoping that his extra sessions can carry him through all six rounds. “Since I have turned pro I have slowed my feet down a lot and I have been working really hard in my sessions to try and speed them back up,” said Byfield. “Before I went pro, one of my biggest attributes was that I had really fast feet so I have been working a lot to try and get those back. Byfield know what a tough customer Harris is from there hours of sparring and although he isn’t expecting to sop ‘Thunder’, he is hoping that his high work-rate will carry him through all of the rounds. “This will be my first six-rounder so it will be my aim to last the six rounds with Andy and with him being a little bit heavier than me I am guessing that it will go the distance,” he explained. “I am not expecting to stop him but if it comes for me then it does and I will be happy. “My work-rate is very high and that is something that we have been working hard on in the gym so that I am ready for the fight and as the rounds progress hopefully that is where I will get some stoppages. “I am not really looking for that in this fight so if it comes it comes and that will be a bonus for me. 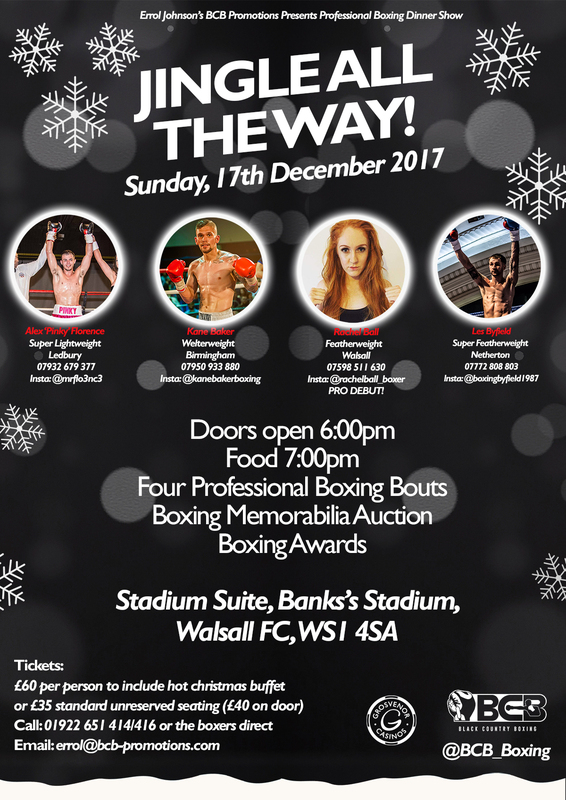 ‘Jingle All The Way’ at Walsall Football Club on Sunday, 17th December also features Walsall’s Rachel Ball who makes her professional boxing debut at the top of the bill. The Aldridge featherweight turns over from kickboxing where she achieved world honours. She is joined by Birmingham welterweight, Kane Baker and Ledbury super lightweight, Alex Florence. Standard tickets for Jingle All The Way, priced at £35, are available by calling the boxers. £60 VIP tickets for tables of ten, with hot Christmas buffet, are available by calling the boxers or Walsall FC Box Office on 01922 651 414/416.